Though there were some kernels of wonderfulness in the Jan. 19 presentation of Miami City Ballet’s Program Two at the Kravis Center, the overall takeaway was that this program was not up to par with past shows. Presenting two works instead of the usual three or four, the program had some clear flaws. Dances at a Gathering, which opened the performance, was a pastel mosaic of solos, duets and larger groupings that was choreographed by Jerome Robbins in 1969 when he returned to New York City Ballet after his success on Broadway and a 13-year absence from the company. The overly long work is choreographed to series of 18 mazurkas, waltzes, and études for piano by Frédéric Chopin. Lasting over an hour, it required that everyone – the 10 dancers, the pianist and even the audience – demonstrate stamina. Playing from the orchestra pit, company pianist Francisco Rennó displayed wonderful artistry, giving a virtuosic performance of Chopin’s immensely danceable music. The movement vocabulary that Robbins created for Dances at a Gathering, which is reminiscent of Slavic folk dance, is Robbins at his best in ballet. With modified gestures, hands on hips, arms cocked to back on head, the five women and five men gathered and dispersed in vaguely romantic interactions. It is a pleasing and palatable dance. The steps are lovely and the dancers articulated them well, making it all go down easily and deliciously. When Robbins was in the midst of creating Dances at a Gathering, he decided to show his dance to George Balanchine. At that point, it was a 25-minute work. Balanchine, after watching the dance, compared it to popping popcorn in one’s mouth and encouraged Robbins to create more and more of his appealing movement, which he did – more than doubling it in length. Even though Robbins had said that there were no plots or roles in Dances at a Gathering, the Jan. 19 performance would have benefited from more consistent and stronger theatrical connections between the dancers onstage. The continuous mixing up of the 10 dancers in the multitude of groupings made it seemed like there was an endless stream of dancers. This, together with the fact that it went on for so long, made it essential that the audience be engaged and stay connected with every dancers’ interactions onstage; otherwise, the amount of time spent watching seemed without purpose. Even the beauty of the movement started to just wash away. It became too much of a good thing. That night’s performance seemed to orbit around returning principal dancer Katia Carranza, who was a sparkling presence, showing off her pristine technique with a delightful ease. Emily Bromberg was also memorable giving a delicate and sensitive performance and Renan Cerdeiro was both energetic and elegant especially in his impeccable series of double tours en l’air landing deeply in his pliant grand plié. The company premiere was Brahms/Handel, a little-known work that tried to hold down the second half of the program. Robbins was a co-choreographer along with Twyla Tharp; the collaborative work was commissioned by New York City Ballet in 1984. Robbins and Tharp, who are both known for reaching across the dance divide to create works that melded different dance styles, set the dance to Johannes Brahms’ Variations and Fugue on a Theme by Handel. This energetic and imaginative set of variations, composed in 1861 for piano but orchestrated here by the British composer Edmund Rubbra, was rousingly played by the Opus One Symphony under the baton of Gary Sheldon. The 28-minute work was choreographed for 28 dancers. 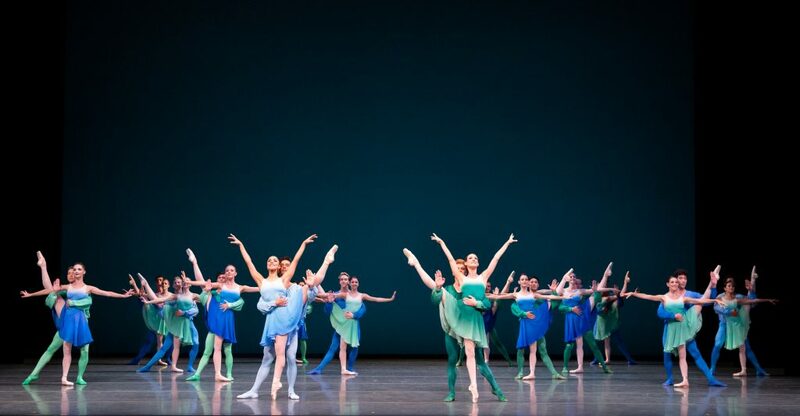 In the 25 ensuing variations, the dancers were divided into teams (14 Robbins dancers dressed in blue and 14 Tharp dancers dressed in green) and inundated us with a barrage of steps that ostensibly characterized their choreographer captain. The quick-silver Nathalia Arja (who replaced Tricia Albertson) and the high-voltage Alexander Peters led the green team, while the lovely Jennifer Lauren and dynamic Kleber Rebello led the blue team. Cerdeiro had to quickly step in for Rebello, who unfortunately must have injured himself in his first sauté entrance. The enormous cast was bursting at the seams with an almost unbridled energy as they introduced their vocabulary of movement – the blue showing a regimented precision that was almost comical and the green demonstrating a looser approach to movement that, at times, was just plain unattractive. The cross-referencing ended up in various unfocused sections where solos or duets were danced in front of fast-moving groupings of dancers. The teams finally merged together to dance in an elongated finale where some ungainly signature steps and lifts stood out in the tumult of movement as they were relentlessly repeated. It became necessary (once again) for all – the dancers, the musicians and the audience – to demonstrate stamina in order to make it through the co-choreography. It’s interesting to note that the next work Tharp created was the spectacular In the Upper Room (1986), a kinetically charged marathon that successfully uses the clashing of different groups (one wearing pointe shoes and the other dance sneakers) with tremendous success. Even though the enormous cast in Brahms/Handel expended a great deal of energy onstage, the whole ballet fell short and was something of a downer after the exciting momentum the company has been gaining by consistently presenting four strong programs in every season. Was the reason for presenting it just that Artistic Director Lourdes Lopez was – as noted in the program – the only dancer to ever perform both the blue and the green ballerina roles? I hope not.